The Cleveland Indians continue to try slip and slide their way to improving before the winter meetings as the Indians sent catcher Yan Gomes to the Washington Nationals in return for two minor leaguers that we know well and a player to be named later. The 31-year-old Gomes still had three years to go on his contract (7,9 and 11 million per) but bounced back from some weaker seasons to make the All-Star team in 2018 as he hit .266 with 16 homers and a career-high 26 doubles. Still, even with the solid numbers, Gomes played in 112 games. which seems like a low number but was actually the second most that Gomes played over a season. 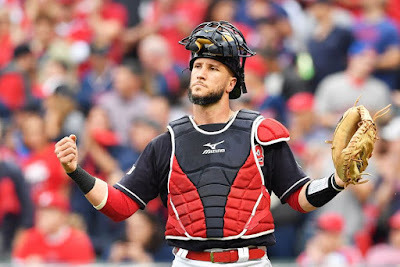 The Indians now suddenly appear vulnerable behind the plate as they will be elevating backup Roberto Perez to the main backstop and they will be doing so after Perez hit just .168 in 62 plate appearances, which raises plenty of questions on whether Perez is capable of being the full-time water carrier behind the plate. Eric Haase will finally receive a chance to make the team in Cleveland after a nine-game debut last season as the backup or platoon partner for Perez. Haase hit 27 homers in 2017 at AA Akron and 20 for AAA Columbus in 2018, so he has the potential to add similar, if not more power than Gomes, but contact questions remain after hitting just .236 for the Clippers and striking out 143 times. Cleveland's return doesn't seem terrific for me and I've had plenty of experience watching the two play. 21 steals in 89 games. The 23-year old Johnson hit 17 homers in 88 games for Low A Hagerstown in 2017 as the surprise players in the Nationals system in that year. Johnson hasn't produced similar numbers since in the remainder of 2017 at High A Potomac, nor last season at AA Harrisburg, but has the tools to rebound with plus speed ( seven triples in 2018) and could eventually be a helpful player for the major league Indians. Still, Johnson is far from a sure thing and his nothing special numbers at AA last year does make me wonder how likely that outcome may be. Johnson could start at AAA Columbus, but I'd think that he may start back at AA with the Indians affiliate in Akron with a good month giving him a chance to move to Columbus. 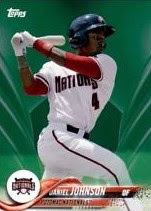 6'6 righthander Jefry Rodriguez was once the highest pitching prospect in the Washington system, before the days of Giolito, Lopez, and Fedde, but the production never matched the hype over his years in short-season and Low A with numbers that resembled pitchers more likely to be headed to independent ball than the majors. Rodriguez did perform well in his first appearances at High A in 2017 before being suspended for eighty games for PED usage and put together a solid season in 19 starts at AA Harrisburg and AAA Syracuse with 102 strikeouts in 100 innings. Rodriguez would eventually spend time with the Nationals, compiling a 3-3 record with a 5.71 ERA and walking almost as many as he struck out (37 to 39) over 14 appearances (eight of those starts). Rodriguez has a plus fastball (mid-90's) and a strong curveball but hasn't mastered the finesse' part of the game and turns 26 during the 2019 season, so Rodriguez could still break through, but I wouldn't bet on that happening and I'd go even farther and think that he might have more of a future in the bullpen eventually than as a starter. Rodriguez will be given a chance to make the Indians but could start the season in the AAA Columbus rotation. The Indians also will receive a prospect to be named later in the trade, but I really am not thrilled with this trade. I can understand moving Yan Gomes with his value at its peak between a strong 2018 and a controlled contract, but I would have expected more from making a trade such as this. Jefry Rodriguez looks to me to be a bullpen arm more than a starter and with his command problems on occasion might not be counted on for that role. Daniel Johnson appears to be another toolsy type that the Indians appear to run off the assembly line, such as Greg Allen, Tyler Naquin, Bradley Zimmer etc. Fast and athletic, Johnson does have a chance to hit for more power than those players, but that hope is almost entirely from that half season in the South Atlantic League and I think his ceiling is more of a 4th outfielder or a platoon player than a 500 at bat starter. I'm not going to say that this is entirely about money (although I'm sure at least a little of it is) and I'm not going to knock the Indians for being cheap as so many do as a reflex anytime that the Indians do almost anything either. I'm just questioning the prospects that coming back and hoping that the questions can eventually be answered in Cleveland and not in Columbus or Akron.